Comviva, the global leader in providing mobility solutions, today announced that its CRBT Platform is powering one billion caller tunes in India everyday, constituting 86 percent of all the CRBT traffic originating in the region. Globally, the company is powering personalized music ring back tone for 224 million mobile users, constituting 45 percent share in worldwide market. Comviva entered the CRBT market place in the year 2004, with its product Caller Ring Back Tone. With Comviva's CRBT footprint spanning across two dozen deployments across the globe, the company has seen the volume of caller tunes increase on its platform exponentially. The company handles the World's single largest VoLTE CRBT deployment allowing the subscribers to search and discover caller tunes from an extensive library of over 4 lakh songs across genres such as bollywood, regional, international, instrumental, and devotional content. Speaking on the occasion, Atul Madan, Chief Operating Officer, Mobile Lifestyle Solutions at Comviva, said, "In today's competitive environment, telecom companies must strive to convert every customer interaction into an opportunity. We are happy to say that our CRBT platform has allowed telecom operators across geographies to drive deeper customer engagement with personalized ring back tones." 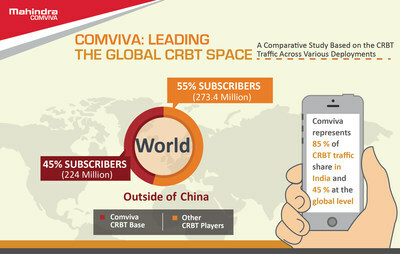 "Comviva CRBT offers novel experience across the digital presence of user and operator. One such interface chatbot provides discovery and purchase of service intuitively via natural language processing. Additionally, smart speakers add more discoverability to the service," further added Atul. CRBT is part of Comviva's Digital Lifestyle Solutions that helps operators maximize revenue, ensure easier time to market, service differentiation to meet subscriber's diverse requirements, from digital services to call management. Digital Services platform enables mobile operators to offer a range of digital content-based services like, music, videos, streaming services wallpapers, e-books and text to end subscribers in a seamless manner. These are provided across multiple channels including SMS, USSD, IVR, WAP, the internet and mobile applications.